South Korean Foreign Minister Ban Ki-moon has been nominated by the UN Security Council as the successor to Secretary General Kofi Annan. The General Assembly is now expected to endorse the choice in a vote likely to take place later this week. Mr Annan is due to step down on 31 December after heading the UN for two five-year terms. 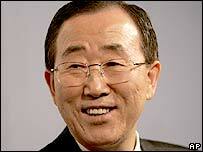 Correspondents say Mr Ban will inherit an organisation where Darfur, Iran and UN reform top the agenda. The 15 council members confirmed their choice for the eighth UN chief in a formal vote on the issue. The 62-year-old Mr Ban had won all four of the council's informal polls and his five opponents had withdrawn from the race. There is a broad consensus within the UN that an Asian should be the next secretary general, the first since the Burmese U Thant from 1961 to 1971. Speaking after the nomination, Mr Ban said the move was an honour and he would work to resolve the crisis over North Korea's nuclear programme, following its claims to have tested a weapon. If appointed, Mr Ban said he would "contribute as much as I can to the resolution of all kinds of problems including the North Korean nuclear issue that may threaten international peace and security." Mr Ban is a career diplomat who rose to become South Korea's foreign minister. He has promised to make the UN more effective, efficient and relevant, while giving few details. The BBC's Chris Morris at the UN says some believe Mr Ban is too low-key and that the UN needs a higher-profile candidate to lead it through difficult times. However, the most powerful member states, particularly the US, want a world-class administrator rather than a globe-trotting diplomatic star - and in Mr Ban they may have found their man, he adds. Correspondents say he will take on an organisation at the centre of many of the world's most intractable problems, from Lebanon to Sudan. If Mr Annan is unable to solve the problems in Sudan's troubled Darfur region in the next few months, this will be top of the agenda. International policy on Iran's nuclear programme will also figure prominently. A key issue has been the UN's commitment to the responsibility to protect civilians in strife-torn countries. He will need to carry out the sweeping reforms that most agree are badly needed for the world body, which has been hit by accusations of waste, mismanagement and the Iraq oil-for-food scandal. Is Ban Ki-moon right for the job?